VRP001 – Wood Box: This is one of 8 boxes that I purchased in a lot off of eBay. The lot belonged to various family members from Morrow County, Ohio. Click here at VRP001 – Wood Box to read the story behind this box and the others in the lot. VRP002 – Wood Box: This is one of 8 boxes that I purchased in a lot off of eBay. The lot belonged to various family members from Morrow County, Ohio. Click here at VRP002 – Wood Box to read the story behind this box and the others in the lot. VRP003 – White Tin Box: This is one of 8 boxes that I purchased in a lot off of eBay. The lot belonged to various family members from Morrow County, Ohio. VRP004 – White Tin Box With Hearts & Flowers: This is one of 8 boxes that I purchased in a lot off of eBay. The lot belonged to various family members from Morrow County, Ohio. VRP005 – White White Tin Box With Flowers: This is one of 8 boxes that I purchased in a lot off of eBay. The lot belonged to various family members from Morrow County, Ohio. VRP006 – Shredded Wheat Tin Box: This is one of 8 boxes that I purchased in a lot off of eBay. The lot belonged to various family members from Morrow County, Ohio. VRP007 – Colorful Geometric Shapes Tin Box: This is one of 8 boxes that I purchased in a lot off of eBay. The lot belonged to various family members from Morrow County, Ohio. VRP008 – Green Metal Box: This is one of 8 boxes that I purchased in a lot off of eBay. The lot belonged to various family members from Morrow County, Ohio. 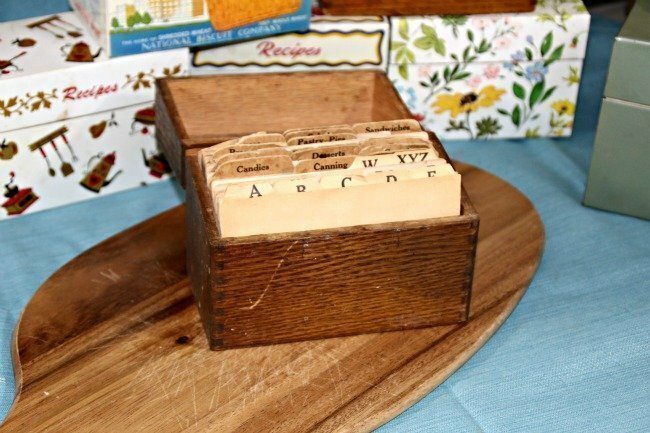 VRP010 – Cardboard Box: I LOVE this vintage recipe box. THESE are exactly the recipes I had in mind when the concept of the Vintage Recipe Project was born. OLD OLD OLD musty recipes that are so faded they are hard to read. The clippings inside from the newspapers are from Los Angeles with no dates but based on some of the notations it appears that the recipes in this box are from the 1930s – 1940s. VRP011 – Wood Box: The person I purchased the boxes in this lot said she bought them at an estate sale in Jackson Hole, WY. The owner of this box loved desserts and most of the recipes in this box are dessert recipes. She mentions friends or acquaintances in her recipes and notates when she found them in magazines. VRP012 – Wood Box: The person I purchased the boxes in this lot said she bought them at an estate sale in Jackson Hole, WY. The owner of this box loved desserts and most of the recipes in this box are dessert recipes. She mentions friends or acquaintances in her recipes and notates when she found them in magazines. VRP014 – Red and White Tin Box: The seller of this box sent me the following: I wish I had more information than this – I purchased these right outside of a small town called Monticello, Iowa. They had an estate auction and sold the house and the contents of the house. I don’t have a name or any other information. Hope this little bit helps, and that you enjoy your recipes. VRP015 – Wood Box: The seller of this box sent me the following: I wish I had more information than this – I purchased these right outside of a small town called Monticello, Iowa. They had an estate auction and sold the house and the contents of the house. I don’t have a name or any other information. Hope this little bit helps, and that you enjoy your recipes. VRP017 – Brown Wood Box: From the seller: My Aunt Ena was married to Dave and they lived all over as Dave was a Forest Ranger here in California. She had a vibrant and warm personality and made friends so easily and her husband was very reserved. She was always collecting recipes from friends and would sit down at her typewriter and peck them out. She collected all these recipes, but I really don’t think she made many of them. VRP034 – No Box: The collection is about 2500 handwritten and clipped recipes from the estate of Dr. John J. POLLOCK (1933 – 2014) and Phyllis KOBYLINSKI Pollock from West Grove, Pennsylvania / New York. The couple was married approximately in 1959. Based on when they were born and married, I am going to assume that collection is from the 1960’s to till the time of their passing.